If you’re like me, you love apples and peanut butter (or any nut butter)! 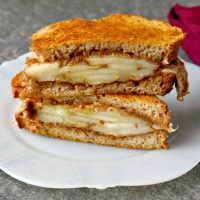 Apple Almond Butter Manchego Grilled Cheese is sweet, nutty, and salty all in one delicious grilled cheese. I actually made this recipe for a grilled cheese event. I shared the pear grilled cheese, but made at least two that week? I think? Don’t quote me on that one, though. Sometimes, I get into a tangent and make a bunch of grilled cheese recipes at once. Don’t ask me why. Consequently, this one has been waiting in the wings until it was time to shine. Now, it’s time to share this delicious recipe with y’all. If you’re new to my blog, hello! Welcome! I hope you enjoy your time here. If you’re not new here, then welcome back! Either way, you must know that I’m a total PB snob. I do not like 99% of the peanut butter that is sold on the markets. No Jif or Skippy for me. Instead, my peanut butter of choice is Kraft. *waving to the Canadians* Hello there! Care to send me a care package of PB? Yes. I know. This almond butter. Since I’m a snob with my peanut butter, I skipped it in this recipe and went with the almond butter. Almond butter or any kind of nut butter I’m not so snobby with. If I can find a good pistachio butter or even a cashew butter I’m truly happy. Or even a sunbutter! That’s pretty good, too. Have you tried sunbutter? You should. It’s delicious. Now, I don’t know about you, but I love nut butters of all kinds on many different things. Pretzels. I truly love them it pretzels. They’re especially good on fruit like bananas and apples. I have also been known to grab a banana, some PB, and a spoon and have a truly delicious snack. Nut butters are good on pears, too. There’s a recipe like that on my blog somewhere. Don’t judge me by the photos. It was an old post. Then there’s the obligatory celery for ants on a log. I don’t know about putting peanut butter with any other veg though. I’ll have to think about that one. Besides your standard Thai peanut sauce, I don’t know what other vegetables go well with peanut butter. Suggestions? Yes, I do realize this is for #AppleWeek and it’s not about the nut butters or peanut butter. It’s about the apples. Those little red globes of amazing sweet and crunchy goodness. Until a few years ago, I’ve never thought of putting apples and cheese together. I mean, I thought about it. My father used to do that all the time with some extra sharp cheese we used to get from Canada. Hey there neighbors to the north! How ya doin? However, I’ve not had them together. Ever. Until I got on a grilled cheese kick. I started making some non-traditional grilled cheese sandwiches. The hubs thought I was off my rocker. But, he loved almost every grilled cheese I made. He liked this one. We split the manchego grilled cheese and this one that day. I devoured this one. He said it was good, but like the other one just a little more. I’m okay with that. He liked the other one a little more. I think it had more cheese. It’s all about the cheese. I know. I’m all over the place with this post. My brain just can’t seem to focus. 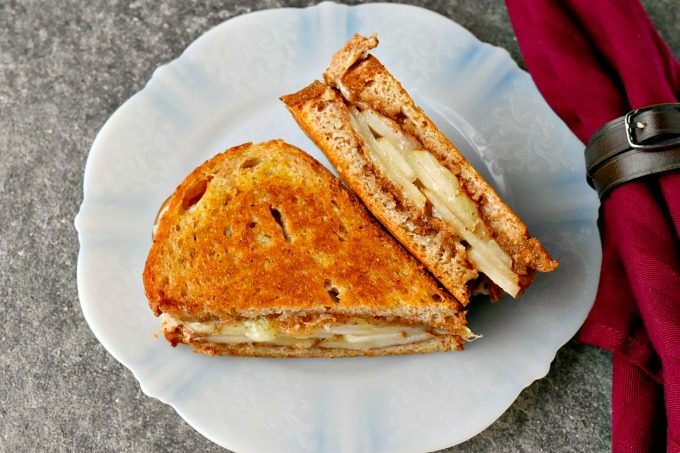 I can, however, focus on the delicious layers of apples in this grilled cheese. There’s a little layer of rich almond butter. You can’t see the cheese. It’s bonded with the apples so you can’t see it and don’t really expect it. Then it hits you! There’s cheese in here!! So, y’all know I covet the little sample cheese bin at Whole Foods. Wait. You don’t know about that?? OMG how could you not? It’s a little bin of their end bits. It has small wedges of cheeses that are perfect to sample and see if you like that cheese. I was that way about manchego. I had never had it before. Consequently, when I saw a bit of it in the bin I snatched it up. It’s like salty Parmesan meets a gruyere or something like that. It has a nutty and salty flavor with a delicious melty sharpness. Consequently, it was the perfect pair with the sweet apples and rich almond butter. Have you made something savory with apples? What’s your favorite cheese to pair with apples? If you're like me, you love apples and peanut butter (or any nut butter)! Apple Almond Butter Manchego Grilled Cheese is sweet, nutty, and salty all in one delicious grilled cheese. Spread the outside of the bread with the butter and put the buttered sides together. Spread 1 1/2 tablespoons of the almond butter on two of the slices of bread. Top with apple slices, 1/4 cup manchego cheese, more apple slices, and 1/4 cup of the manchego cheese. Pick the top piece of bread layered with the apples, butter, and cheese and place in the skillet. Top with other piece of bread. Cook the sandwich 5 to 7 minutes per side or until the bread is golden brown and the cheese is melted. Cool slightly before serving. What a fabulous sandwich, Christie! I love the creamy almond butter, crisp apples and meltingly gorgeous cheese! Pinning! If you have time, please do pop by and share this post on the Hearth and Soul Link Party live on my site now. Hope to ‘see’ you there! Thank you! It was delicious. Even the hubs enjoyed it. Sorry I missed the party. I’ve been a bit out of it with work. 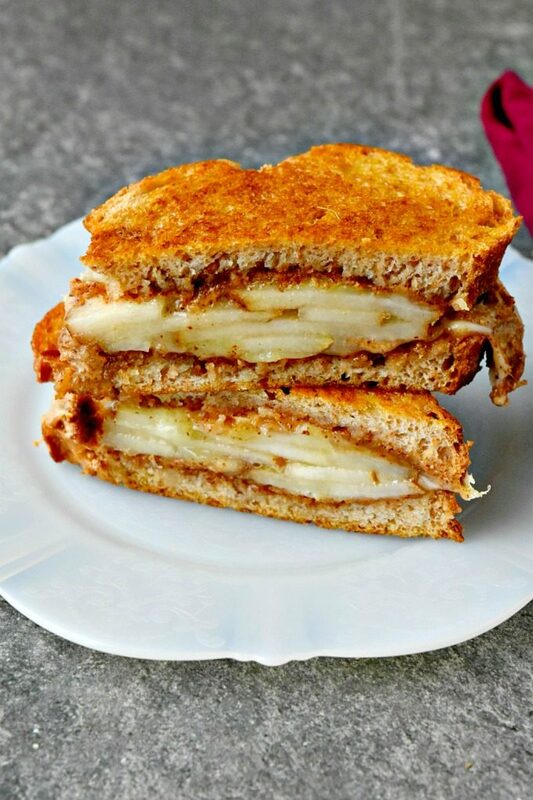 Oh my goodness, this grilled cheese sandwich looks incredible! I can’t wait to try it! I hope you like it as much we did. You hit all the flavor profiles here girl! Looks delicious! Thank you! It was a pretty delicious sandwich. It really is all about the cheese! This looks like the ultimate grilled cheese. The wrong cheese and your grilled cheese is ruined! I am a big nut butter fan as well. And I do love apples and any nut butter together. I don’t use manchengo much, but now you have me wanting to buy some. And now I’m hungry. Thanks a lot! Now that is a grilled cheese! Love the sweet/savory combo! Thank you! That Manchego really makes the sandwich. I love apples and cheese together. A classic pairing. They are a classic pairing. Thank you!